During the holiday of Sukkot Jews are commanded to build a sukkah, or hut, and eat and sleep inside the temporary structure for seven days. The sukkah is built according to a set of religious guidelines and restrictions, determining everything from the roof materials to the size of the walls. These dwellings symbolize the physical structures Jews lived in during their 40 years wandering the desert, and every fall they can be seen dotting the New York City landscape, residing in public parks and next to private homes. Though most New Yorkers routinely see sukkahs, very few step inside. New Yorkers famously approach commuting with fierce focus, staring straight ahead of them or at the ground as they pound the pavement from one location to another. A Wandering Sukkah is a fine art, interactive sukkah experience designed to visually and energetically interrupt this urban rhythm. Created by artists Danielle Durchslag and Ryan Frank, the project is a mobile, artist-designed sukkah truck that will drive through New York City’s five boroughs during Sukkot, parking at varied locations over the course of the holiday. Welcoming in one visitor at a time, the sukkah offers a curated view of the sky within a peaceful, semi-private respite from urban chaos. Rather than ask New Yorkers to come to a set location, A Wandering Sukkah comes to them, inviting them to simply pause, enter the enclosed space, regard the sky, and listen as the city rushes by. Lubavitchers provide Mitzvah tanks, wandering ritual vehicles, and beckon Jews inside to create a more religious world. They believe each Jew who adheres to Jewish practice helps beckon the messiah. A Wandering Sukkah also employs a vehicular ritual delivery system, but for all New Yorkers, regardless of their religious identity. The artists believe each city dweller who enters their sukkah emerges a calmer and more contented urban citizen. While the mitzvah tank facilitates individual acts its creators hope will collectively bring world redemption, A Wandering Sukkah aims to change the pace and energy of New York City for the better, one visitor at a time. Each day during the weeklong holiday of Sukkot, September 27th – October 4th, 2015, A Wandering Sukkah is parking in a different neighborhood throughout the five boroughs. Arts organizations and community centers serve as local neighborhood hosts in each community where the sukkah truck parks, announcing the sukkah’s location and welcoming their constituents to participate in the project. The Invisible Dog, a professional home for both artists, hosted the sukkah’s construction in its backyard before setting it off on its week-long journey. The artists believe that within the traditional constraints of organized religion exist methods of observance and celebration worthy of new interpretations and uses. A Wandering Sukkah uses the format of a religious holiday to give diverse visitors who live in a vast and crowded city an experience that makes them feel ever more expansive – spatially, spiritually, and psychologically. 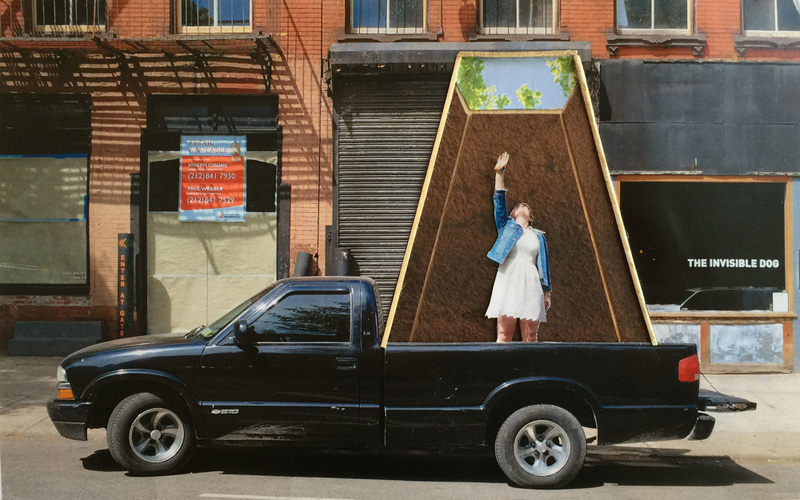 A Wandering Sukkah will be on view throughout New York City from September 27th – October 4th, 2015 and is being presented by The Invisible Dog Art Center. For more information contact Danielle Durchslag and Ryan Frank at sukkahassembly@gmail.com.